This is a plant which has had some name changes. I think we originally got it as lasiantha which proved to be wrong. I am applying it to a 2m evergreen shrub with a ’pebbly’ surface of the foliage somewhat like semi atrata or towards melissodora in appearance. 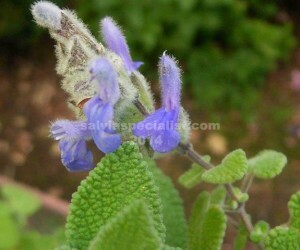 It has spikes of small blue flowers for a long period. Keerlii does not like frost below -2C though I haven’t trialled it enough to be sure.